It took longer than planned, but Enclosure E was finally completed in June and 3 bears, Oscar, Arkana and Sibear are now enjoying it. Arkana is particularly happy because she really hates being locked up. She arrived at Samboja Lestari as a cub many years ago and went for daily walks in the forest until she got too big to handle. She was then kept in a cage for many years but is now happy to have some space and freedom again. She loves to climb the trees and sleep in them. During the months of July and August we had a new “training enclosure” built. 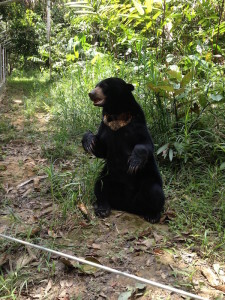 This is small enclosure of about 300 m2 in which the bears learn about electric fencing. 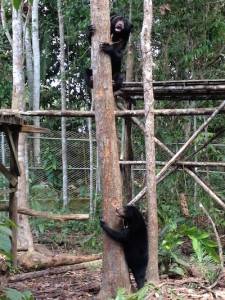 They usually spend a few weeks in this enclosure where they can be monitored and are then transferred to a large forest enclosure in which they recognise the same electric fence that they have learnt to respect. 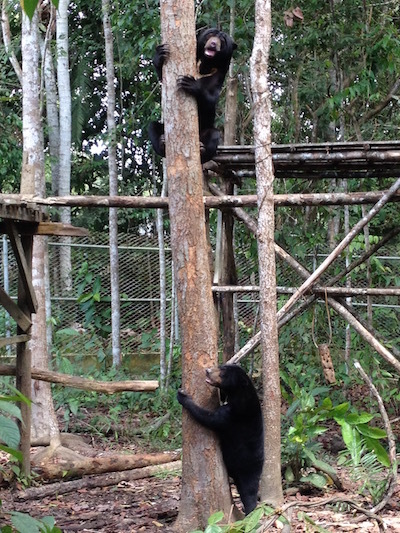 So we now have 2 training enclosures at Samboja where up to 6 bears can get ready for the large forest enclosures. We are now beginning work on Enclosure F at Samboja Lestari. 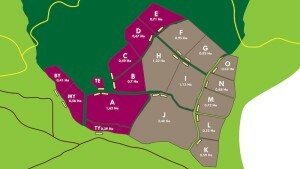 This enclosure will be 0,95 hectares in size with 4 dens. The 4 bears who will be moved to this new enclosure are now in the Training Enclosure, learning about the electric fencing. Enclosure F will be entirely paid for by BOS Switzerland and we hope to finish it by the end of November. 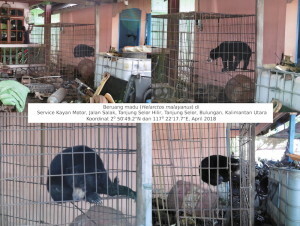 This fall Sunbear Outreach also plans to make another 1 hectare forest enclosure and 5 dens for the bears at the Care Centre of the Orangutan Foundation International (OFI) in Central Kalimantan. The budget needed for this is USD 48 000. OFI doesn’t have the resources to help financially, so Sunbear Outreach needs to find all the funds on its own. I hope to raise the money and get the enclosure built before the end of 2018 so that it can become a new home for a poor bear kept in very bad conditions in a town called Tanjung Selor, as you can see on the pictures.